NYKS Volunteer Recruitment 2019 of 12000 Vacancy advertisement is released now. Unemployed candidates have to use this 12000 Volunteer Vacancy in NYKS for grabbing the employment. This page covers up all the details like educational qualifications, age limit and Nehru Yuva Kendra Volunteer Salary info here. Satisfied aspirants with the notification download your NYKS Volunteer Application Form@nyks.nic.in. 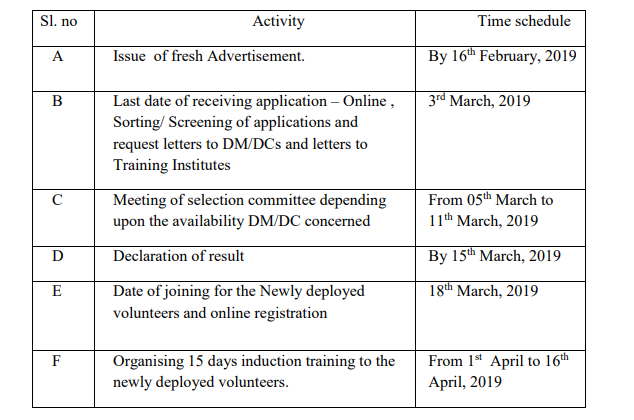 Dates in which NYKS Volunteer Recruitment 2019 offline form accepting are 16th Feb to 3rd March 2019. Merit list will announce 0n 15th March 2019. Job seekers who are having the emergence of getting any job can select the new Nehru Yuva Kendra Volunteer Recruitment 2019. This recruitment is open for all the candidates who are having a minimum 10th qualification. There is no examination or interview. Directly by seeing your 10th marks and abilities to do this job, your selection will be decided against this NYKS Volunteer Recruitment 2019. Furthermore, essentials like clear educational qualifications, age limit and selection process are reported by recruitmentindia.in here. Main doubt for the applicants is regarding the Nehru Yuva Kendra Volunteer Salary details. That information also placed here. Total schedule of the recruitment is mentioned in the notification. As per the dates are given, 3rd March is the application closing date, 15th March is the result date. From 18th March 2019 registration to the selected candidates will start and finally, the training session to the joined candidates is in between the 1st to 16th April 2019. NYKS Volunteer Recruitment giving the employment offer to nearly 1200o individuals. The most interesting thing in this recruitment is only on the basis of the academic marks mentioned in the NYKS Volunteer Application form the board selects the contenders to these 12000 Volunteer Vacancy. So to attend this NYKS Volunteer Selection Process applicants no need of doing any extra work or preparation. Simply by submitting the Nehru Yuva Kendra Volunteer Offline Application Form on or before 3rd March 2019. The format of the application is attached below along with the notification section. Immediately after seeing the eligibility criteria and salary details, contenders can take the decision of either to send the application form or not. The NYKS recruitment board finalizes the candidates who are given the right format of applications within the time. NYKS Volunteer Educational qualification is Minimum class 10th pass certificate. Maximum Age: 29 years as on 1st April 2018. Check the official notification to know the application fees details. NYKS not conducting any selection rounds. Just on the basis of the application details merit list will be released. Nehru Yuva Kendra Volunteer Salary is Rs.5000 after successful training. Total Volunteer Vacancy mentioned in the NYKS notification is 12000. Nehru Yuva Kendra Sangathan published the detailed notification of 12000 Volunteer Vacancy in NYKS. It has discussed each and every detail of the recruitment starting from the educational qualification to the final result announcement date. The given information in the NYKS Volunteer Notification is explained in the simple words so the information can reach the contender more effectively. Only after getting the NYKS Volunteer Recruitment overview they can take the step of applying to this recruitment. From our recruitmentindia.in post only you have the possibility of downloading the application form. Hence contenders get to know the Nehru Yuva Kendra Volunteer Salary details from here only. Nehru Yuva Kendra Sangathan opts the offline mode of NYKS Volunteer Application forms. It has given the hard copy format of the application also. What format of application is recommended by the officials that have to be followed by the candidate only? So download the given nyks.nic.in Volunteer Offline Form, then write all your particulars that are true and attach the xerox copies of the educational certificates, other documents and send through the normal post. NYKS recruitment cell official will accept the posted applications until the office hours of 3rd March 2019. Verification work of the applications has started immediately after taking the form. The NYKS Volunteer Result date is 15th March 2019 hence by that time the list of qualified candidates has to be prepared. By April 2019, the entire NYKS Volunteer Recruitment 2019 process will be completed. 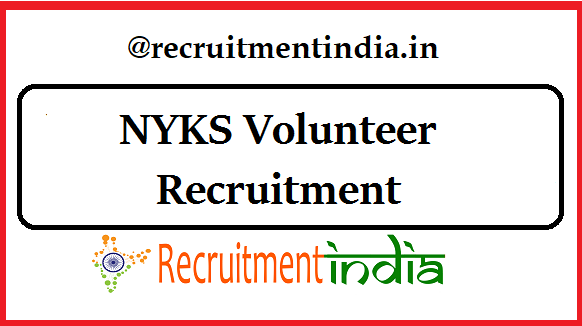 The post NYKS Volunteer Recruitment 2019 | 12000 Volunteer Vacancy | Apply Now appeared first on Recruitment India.